I was looking for a photo op of kids getting on a bus for the first day of school yesterday morning but stumbled on a better one: Margit Johnson heading to the airport and Susan Marino heading to her job at the University, using the new Northfield Metro Express service. The downtown Northfield stop is at Water St. and 7th St. across from the Northfield Wells Fargo Bank. 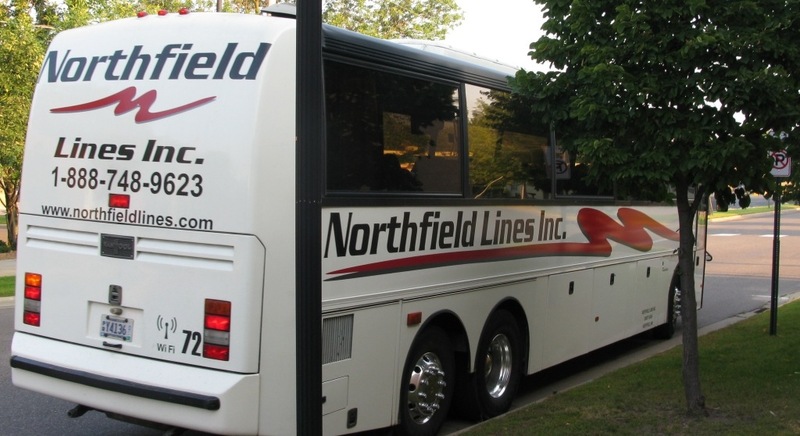 See the July 17 Nfld News story of how the service came to be, featuring the owners of Northfield Lines, Larry Benjamin and John Benjamin, and their marketing director, Lisa Peterson (see her blog post on Northfield.org). And kudos to Northfield Lines for using Twitter and Facebook.